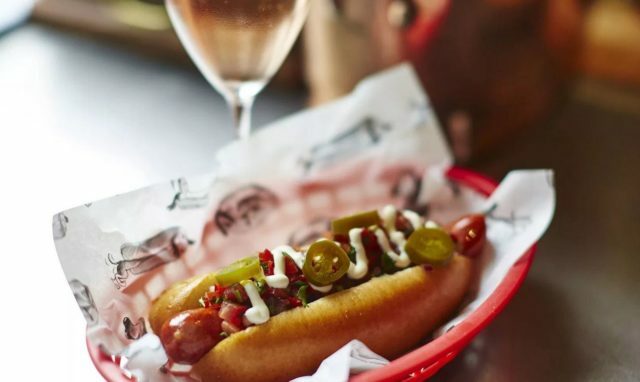 Champagne and hot dog restaurant Bubbledogs, based in London’s Fitzrovia, will close for refurbishment this month, re-opening in May with “an increased focus on hand-selected grower Champagne”. Founded by ex-chef and sommelier Sandia Chang and her husband, chef James Knappett, who runs two Michelin-starred restaurant Kitchen Table at the back, the restaurant opened in 2012. Alongside a change in décor, the updated Bubbledogs will offer an extended wine list and a revised food menu. Currently centred around grower Champagnes, the new wine list will also include a selection of still wines from the area, while the food menu will offer new additions such as hotdogs ‘Truffle Shuffle,’ topped with truffle celeriac remoulade, and ‘The New Yorker’ with aged beef and caramelised onions. The bar snacks menu will also provide more choice, with a Comté tater tots and tater tots served with caviar and crème fraiche. In contrast to Bubbledogs’s current interiors of exposed brick and wood, the new design is set to be a “refined and modern wine bar, with deep purple and mustard tones highlighted by copper accenting,” featuring marble table-tops and built-in Champagne troughs. Bubbledogs will close for refurbishment on 24 March, re-opening on 14 May.